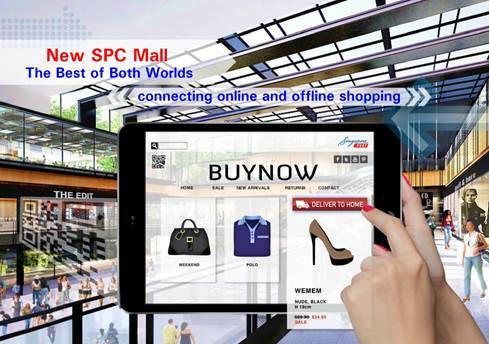 Weeks after revealing plans to use drones to deliver the mail, Singpost — Singapore’s postal service provider — has unveiled another futuristic e-commerce concept, a mall that combines online and offline shopping together under one roof. A consumer could browse in-store, purchase the product and arrange for delivery of the product directly to their home. The consumer could then continue shopping, watch a movie or have a meal in the mall without having to carry bulky shopping bags. The retailer, on the other hand, could save on storage space in the store as fulfilment would be done at the backend of the warehouse. It’s certainly a bold vision, particularly since this mall would be the first of its kind — even though online-to-offline is already a trend that is enabling some physical retailers to extend their reach to customers through the internet. Some types of shopping are based around instant gratification or spontaneity, i.e. actually taking a product home with you, but Singpost is betting that in some cases — such as bulkier items or more mundane purchases — shopping online and a speedy home delivery is what the people will want. We’ve already seen Alibaba invest $4.6 billion in foster closer links between online and offline sales. That deal saw the Chinese e-commerce firm — which is an investor in Singpost — buy a 20 percent slice of Chinese physical retail giant Suning. Part of that coming-together will see Alibaba given the opportunity of “a physical experience” with products in store — i.e. try it in person and buy it via Alibaba — while there are plans to offer after-sales support for products bought via Alibaba’s online services. Singpost, however, is taking this concept to the next level with a mall. For now, only cinema firm Golden Village Multiplex and coffee chain Kopitiam are confirmed tenants. It is easy to see how both of those businesses could benefit from closer alignment with internet sales and distribution, but it will be interesting to see which other companies inhabit the mall when it goes from vision to reality over the next 18 months or so. And, of course, whether the concept takes off in other countries.